Language is often a central question in postcolonial studies. During colonization, colonizers usually imposed or encouraged the dominance of their native language onto the peoples they colonized, even forbidding natives to speak their mother tongues. Many writers educated under colonization recount how students were demoted, humiliated, or even beaten for speaking their native language in colonial schools. In response to the systematic imposition of colonial languages, some postcolonial writers and activists advocate a complete return to the use of indigenous languages. Others see the language (e.g. English) imposed by the colonizer as a more practical alternative, using the colonial language both to enhance inter-nation communication (e.g. people living in Djibouti, Cameroon, Morocco, Haiti, Cambodia, and France can all speak to one another in French) and to counter a colonial past through de-forming a “standard” European tongue and re-forming it in new literary forms. [A] specific culture is not transmitted through language in its universality, but in its particularity as the language of a specific community with a specific history. Written literature and orature are the main means by which a particular language transmits the images of the world contained in the culture it carries. The Empire Writes Back, 1989. The authors are careful to point out, however, that abrogation alone, though a vital step in “decolonizing” a dominant language (see Ngũgĩ) is not sufficient, in that it offers the danger that roles will be reversed and a new set of normative practices will move into place. Another issue Ashcroft et al. describe is the three types of linguistic communities they identify: the monoglossic, the diglossic, and the polyglossic. Monoglossic communities, corresponding roughly to old settler colonies, are places where “english” (the lower-case “e” in “english” denotes local, non-standard/British usage) is the native tongue. Diglossic communities, by far the most common of the three, occur where”… bilingualism has become an enduring societal arrangement, for example in India, Africa, the South Pacific, for the indigenous populations of settled colonies, and in Canada, where Québecois culture has created an artificially bilingual society” (39). Finally, polyglossic societies “… [o]ccur principally in the Caribbean, where a multitude of dialects interweave to form a generally comprehensible continuum” (39). The issue of languages raises several polemical questions for consideration in the study of literary texts: does the author choose to work in a local language or a major European one? If the former — how does the work get translated and by whom? What might the translation have done to the work? What kind of semantic processes of abrogation/deformation and appropriation/reformation occur in the work? When a local language lends terms, in what context do they occur? Finally, what does the use of language imply about an implicit theory of resistance? For other views on language in postcolonial studies see authors such as: Braj B. Kachru, Raja Rao, Bill Ashcroft, W.H. New, Edward Kamau Brathwaite, and Chantal Zabus, among others. Al-Dabbagh, Abdulla. Literary Orientalism, postcolonialism, and universalism. New York : Peter Lang, 2010. Ashcroft, Bill, Gareth Griffiths, and Helen Tiffin. 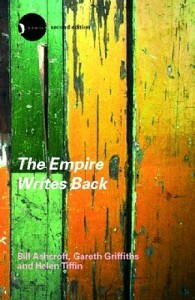 The Empire Writes Back: Theory and Practice in Post-Colonial Literatures. New York: Routledge, 1989. Britton, Celia. Edouard Glissant and postcolonial theory : strategies oflanguage and resistance. Charlottesville, Va. : University Press of Virginia, 1999. Deleuze, Gilles and Félix Guattari. A Thousand Plateaus:Capitalism and Schizophrenia, Vol. 2. Trans. Brian Massumi. Minneapolis: U of Minnesota P, 1987. 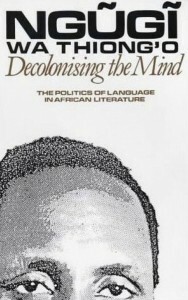 Ngũgĩ wa Thiong’o. 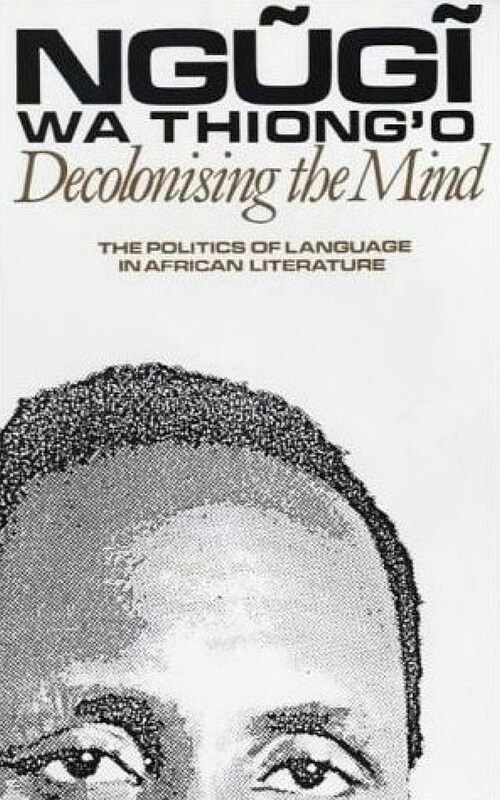 Decolonising the Mind: The Politics of Language in African Literature. Portsmouth, NH: Heinemann, 1981. Ramanathan, Vaidehi. The English-vernacular divide : postcolonial language politics and practice. Clevedon ; Buffalo : Multilingual Matters, 2005. Rushdie, Salamn. Imaginary Homelands. New York: Granta, 1992. Schneider, Edgar W. Postcolonial English : varieties around the world. Cambridge : Cambridge University Press, 2007. Talib, Ismail S. The language of postcolonial literatures : an introduction. London : Routledge, 2002. Vizenor, Gerald. Manifest Manners: Postindian Warriors of Survivance. Hanover, NH: Wesleyan/New England UP, 1994. The Ethnologue, an online version of the reference work describing most, if not all, of the world’s known languages, including creoles and pidgins. A collection of links to various Latin American language sites with both indigenous (Quechua, Aymara) and colonial (Spanish, Portuguese) languages and creoles. Also features a comprehensive list of other linguistics-oriented sites. We all agree culture and language are inseparable. This means when a people’s culture disappears, their language becomes an orphan, invariably becoming the slave of the replacing culture. We all agree no culture (and, therefore, language) is inferior to any other one. Most intellectuals promoting indigenous languages mistake colonially imposed western cultures (dress, dance, architecture, literature, religion especially Christianity and Islam) to be their cultures. If we must jettison English, French, Portuguese, Spanish, Arabic, etc, we must jettison Christianity and Islam for Africa’s indigenous religions because the religion of a people is their constitution. But my country Nigeria has 500 indigenous languages! Does this mean 500 ethnic nationalities and allegiances with 500 cultures and religions and constitutions? isn’t this invitation to anarchy? Shall we not end up with 500 countries? Thanks, you was able to save me from a really long and troublesome afternoon. Completely Appreciated. Hey, thanks for the great website.